Nevada is the first western state to caucus and third behind the New Hampshire primaries. If you happened to follow the Iowa caucus on February first, you may have heard people questioning the legitimacy of precinct chairs, who, by the way, are volunteers. In Iowa, Clinton’s two delegate win over Sanders was decided by a coin toss. In Nevada, precinct chairs aren’t required to take formal training. Natalie Van Hoozer takes us to caucus trainings in Reno to see how volunteers with each party are preparing for Nevada’s caucuses on February twentieth and twenty-third. The Washoe County Democratic party office walls are lined with posters that say, “Commit to Caucus!” Roughly thirty chairs are occupied by volunteers waiting for basic caucus training to begin. Staff member Kerry Durmick takes her place at the front of the room in between a poster titled “caucus math” and the American flag. In this caucus simulation, Muppet characters replace presidential candidates. Unlike a Republican caucus with secret ballots, Democratic supporters have to stand in the corner of the room for the candidate they support. In this case, volunteers are voting for their favorite Muppet. Temporary precinct chairs are asked to stay for a more detailed training. Unlike the other volunteers, they have a bigger role. A role that involves doing math. While the math is simple addition, multiplication and division, things can get complicated if detail are overlooked. For example, when determining if a candidate is viable to receive delegates, it is important to always round up. Precinct chairs must calculate how many votes make a candidate viable to be awarded delegates. It’s based on the total number of people at the caucus that day. The precinct chair then calculates how many delegates each candidate will receive from the precinct as a whole. This is part that requires math. If a precinct can award five delegates, for example, and there are sixteen caucus attendees, a candidate can be awarded delegates if three people at the caucus support that candidate. If there is an equal amount of support for two candidates, both the Democratic and Republican caucuses use a deck of cards in Nevada instead of tossing a coin like in Iowa. The precinct chair draws the cards, and the candidate who draws the higher one is awarded the deciding delegate. All math is double-checked by another volunteer acting as the precinct chair’s secretary. “At first I thought, ‘Oh my gosh, I’m not going to be able to do this.’ But then you get the packet and you see how really easy it is,” said 57-year-old Patrisa Williams during her first training experience as precinct chair. Williams and other precinct chairs are asked to attend another training closer to the day of the Democratic caucus, which is February 20, in order to refresh all of the information they learned in training. The Washoe County Republican party is also busy training volunteers for the February 23 caucus. In a room of similar décor, thirty-five volunteers gather and are given thick yellow packets of paper. 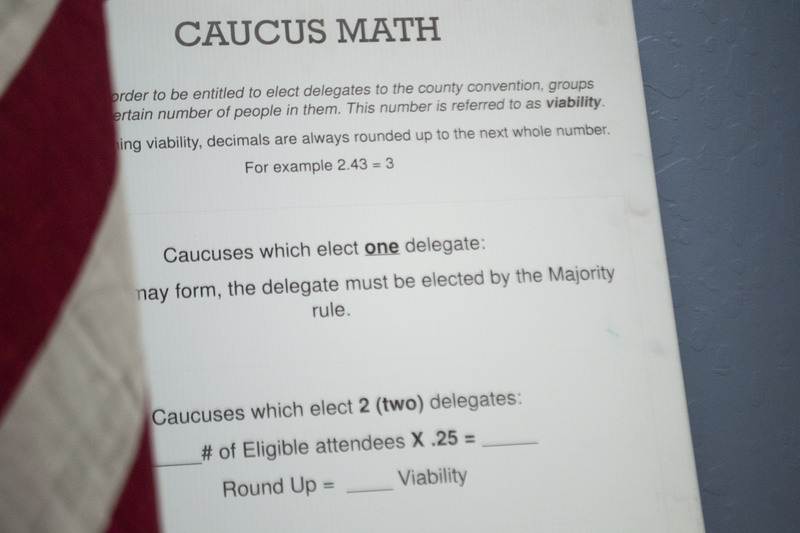 Unlike Democratic trainings, no math is required thanks to the secret ballot. “They don’t have to have a training, but we prefer that they come. If they want to be the chairman, they should come to a training so they know what’s going to happen in that,” said caucus chair Phyllis Westrup. That’s right; for both Democrats and Republicans you can be appointed as the temporary precinct chair even if you have not gone through training. “The first person who shows up gets this packet in this precinct. They become what is called the temporary chairman once six o’clock comes,” said Westrup.